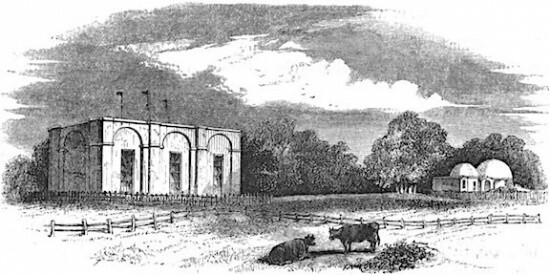 The magnetic observatory at Makerstoun (Roxburghshire, southern Scotland), where John Allan Broun worked from 1842 to 1849. © anonymous (1860). Might the solar corona not just resemble, but actually facilitate the terrestrial aurora? The German baron Carl Ludwig von Reichenbach (1788-1869) professed as much when he posited, in 1851, that the earth’s magnetic field is “continually receiving accessions through the vast contributions poured out upon the earth by the sun and moon”, which “at once become polarized, that is to say, the current goes towards the terrestrial poles” and so “cause irregularities in the appearance of the northern light”. Another area in which Broun may have set a precedent is that the ether pervading the universe is “an electric medium”, which can be made to glow: “Is not the zodiacal light the magnetic æther in a luminous state, repelled by the solar magnetic poles? … Are not the extent and intensity of the zodiacal light related to the periods of the spots, as Cassini and Mairan supposed?” Whilst today only a minor component of the zodiacal light is held to be self-luminous, Broun correctly sensed that ‘ether’, now known as the interplanetary and interstellar medium, is a plasma potentially visible in glow mode. It was only during the Space Age that scientists could confirm that the earth is contained in a magnetosphere which is compressed on the dayside and extended into a magnetotail on the nightside.